It all started with Coffee Prince. Prior to that I was a big fan of the 2004 Korean drama Full House with Song Hye Kyo and pop star Rain. I liked the predictability of the characters in Korean dramas. Sometimes you need things like that in your life. After Full House, I didn’t really get to see a lot of other k-dramas just because there was too much to see and too little time to while away. I went through the Grey’s Anatomy, Prison Break, Heroes and Lost phases in my TV life and after a while I just grew tired of the long seasons where characters constantly break up, get back together or die in the end. What I loved about k-dramas is that they finish the story in just one season. No cliffhangers. No season 2 letdowns. 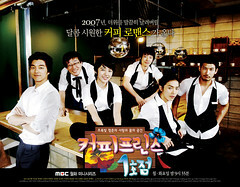 Then came Coffee Prince, which I absolutely enjoyed. The story was cute and the actors were surprisingly good so I got hooked. I even have the full soundtrack on my iTunes. My friend Hannah, who’s like the Asian drama guru in our office introduced me to other dramas like Goong or Princess Hours, which I also enjoyed and the Japanese adaptation of the manga Hana Yori Dango. I think I finished seasons 1 and 2 of HYD in less than two weeks on top of everything else I had to do for my graduate classes. Coffee Prince got me hooked again on Asian dramas. Now, Hannah and I are obsessed with the Japanese adaptation of the manga Hanazakari no Kimitachi e or Hana Kimi, which is about a girl who pretends to be a boy. She enters an all boys school to meet her idol, an athlete named Sano Izumi. GMA-7 is airing the Japanese version while rival ABS-CBN is airing its Taiwan version. I absolutely loved the Japanese version though I haven’t really seen the Taiwan version so I reserve comment for now, on which is better. However, I might be biased because I’m a big Oguri Shun fan. Shun played the role of Hanazawa Rui (Hua Ze Lei in Meteor Garden) in Hana Yori Dango. He’s not really a gorgeous actor but there’s just something about him. What I noticed about k-dramas and j-dramas is that they are so well produced. The story lines may be simple, without the usual pomp seen in Philippine dramas, but they are well directed and each episode is well thought of. I miss that kind of simplicity in our dramas. Today, all we can watch in local television are Messiahnic characters hoping to save the world. I say, enough of those Hollywood prototype dramas. We can’t do another Smallville (Remember Captain Barbell?). Perhaps, we can learn a thing or two from our Asian neighbors. Mhay, try mo watch Proposal Daisakusan. Medyo repetitive and super-sad pero oh so romantic hehe! Cge, magd-dl ako niyan. Nababasa ko nga parang maganda reviews. Congrats, Attorney!